Updated 9:38AM, Thursday December 6th, 2012	by Sam Hailes, Christian.co.uk Be the first to comment! This year Jeremy Camp has added his name to the long list of Christian contemporary artists giving a Christmas album a try. The 10 track album is a little on the short side, but contains a great mix of fun, rocked up tunes and more reflective renditions of classic Christmas songs. Christmas: God With Us moves quickly. You can listen to the entire CD in just 35 minutes. Opening with the shortest track on the album, Jingle Bell Rock, Jeremy has some fun with guitar riffs and mimicking the vocal performances of the rock n roll greats. Let It Snow starts off with an upbeat acoustic vibe bound to get your foot tapping. Such tunes do make you wonder if Jeremy should release a jazz or rock n roll album in the future. Some of the singer’s more relaxed songs are unremarkable. Songs such as Away in A Manger are over-familiar, it takes an attention grabbing arrangement to make them stand out. Sadly, some of Jeremy's covers are too middle of the road to provoke any kind of emotional response from the listener. Extra lyrics have been added to Joy To The World and Hark The Herald Angels Sing. Some of them work better than others, but it's good to see Jeremy thinking about putting a fresh spin on songs. The stand out track on the album is without doubt Mary Did You Know. The atmospheric opening gives way to Jeremy’s solid voice and a quiet piano sound. It’s the most solidly produced track, and also the most interesting in terms of arrangements. Jeremy sings the song with such belief and passion, he could have written it himself. The song rises and falls magnificently. It’s a superb effort. The title track God With Us eventually appears deep into the album. 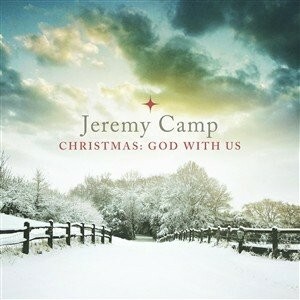 Bound to delight fans of Jeremy’s vertical focused worship tracks, the song could easily be sung in church. It doesn’t sound particularly Christmassy, but the lyrics are suitably Jesus-focused. Aiming to delight fans of both his heavier and lighter sounds, Jeremy has produced a well-balanced record. It may be short but each track is well worth the listen. Fans have been rightly disappointed that only one original appears on the album, but most of the covers are very strong, making this a solid album bound to help you enter into the Christmas spirit.